What is the Operate API? Our open API policy allows third parties, from Workspace Operators to software platforms, to integrate their products and applications with Operate. Please see our API documentation, you can find the descriptions to object types including the ones listed below. Leads: are enquiries that companies or individuals submit to your organization. All Leads require a Location. All come from a Lead Source which can vary from a broker to a walk-in. Leads can be rejected (Lead Rejection Reasons) or overturned (Lead Overturn Reasons). Accounts: represent business entities. There are three types of Account records: Prospect, Customer or Broker. Account is the key endpoint for creating, modifying and deleting a Prospect, Customer or Broker. An Account has an Account Type default value for Account Type is -1 Customer. Users: are your staff - they have their own login credentials, profiles and email signatures. Users have different permission levels which an Administrator can set. Contacts: are associated to a Lead or Account. Contacts are end users of the Operate Portal they do not have access to Operate. Products: represents anything you sell. Services are included here as well. Examples of commonly used products are: desks, meeting rooms, offices. Unfortunately, essensys does not provide sample code other than the existing sample code in our API docs - https://operate-apidocs.essensys.tech. Are you receiving an invalid parameters error even if the data you are sending is from our API reference documentation? Updating Properties and Fields – is there a way to update property X of the Y object via the Rest API? If you are wondering why updating properties are not working, please try and do a POST method rather than a PUT. Often POST is used to create a new entity, but it is used to update an entity. Would it be possible to initiate a booking via the Operate API then switch over to the Operate Portal to either register or login and checkout to make payment? Unfortunately, no you cannot make a booking via the Operate API then switch over to the portal to make payments. 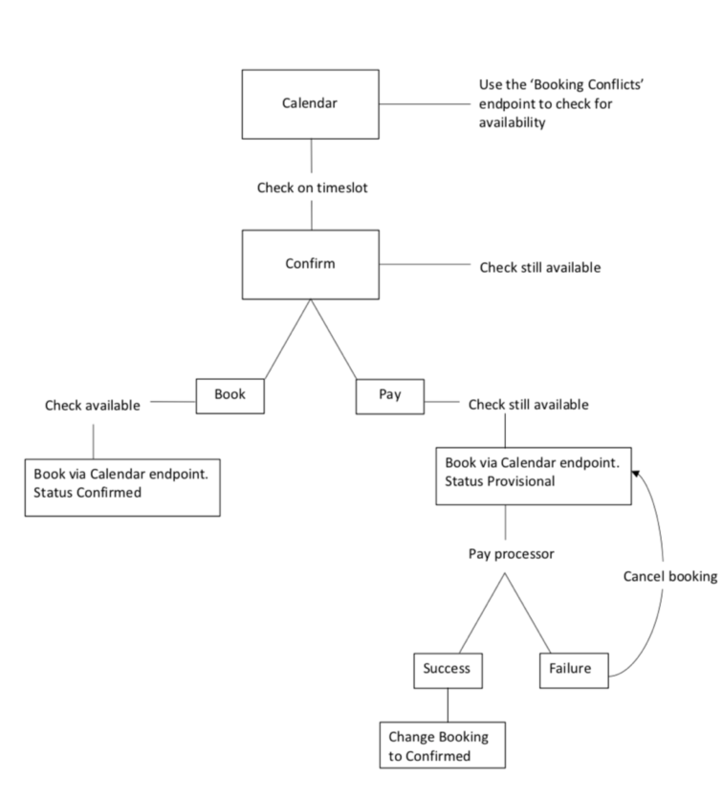 Is it possible to add and pay for catering items when booking a meeting room using the Operate API? Please see the recommended flow illustrated below. ‘Booking Conflict’ endpoint is used for checking used space. Then allowing you to identify free space. Whenever there is a potential time lag, check for availability with Booking Conflict endpoint. If you go to payment processor, book provisionally until they pay. What should we be calling in order to pass lead information into the system? How is it possible to pass Lead information into Operate? To create a Lead, you will need to send a PUT request with the relevant JSON (with the minimum fields). In the sample code there are examples of this. If you PUT this then you can add fields one by one afterwards. Can we set up Lead Synchronisation between Operate & Salesforce? Yes, if you would like to synch up your leads from Salesforce to Operate, whenever a lead comes into Operate/Salesforce you can use the API to push that lead into the desired platform be it Operate or Salesforce. Is there a webservice to push the license pdf to Salesforce? Unfortunately, you cannot push a pdf copy of a licence to Salesforce. Is it possible to pull number of active members that are registered on the system? It is possible to query the API to find out how many active members are on Operate. You can pull the data you like, how you use it and the selection criteria is up to you. Is it possible to check the payment status, for example retrieving members who haven’t paid past the due date? Again, yes, it is possible to pull the data, how you use it and the selection criteria is up to you. This is the case across the board when pulling data.